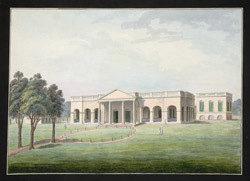 The East India Company was influential on Indian culture and a new painting school developed in response to the tastes and influences of the British serving with the East India Company. Company painting first emerged in Murshidabad in the second half of the 18th century. It is a style of miniature painting that subsequently spread to other British centres. This drawing shows the Captain's stuccoed single-storeyed house with a verandah and pedimented porch.